Thunderheart is a 1992 contemporary western mystery film directed by Michael Apted from an original screenplay by John Fusco. The film is a loosely based fictional portrayal of events relating to the Wounded Knee incident in 1973, when followers of the American Indian Movement seized the South Dakota town of Wounded Knee in protest against federal government policy regarding Native Americans. Incorporated in the plot is the character of Ray Levoi, played by actor Val Kilmer, as an FBI agent with Sioux heritage investigating a homicide on a Native American reservation. Sam Shepard, Graham Greene, Fred Ward and Sheila Tousey star in principal supporting roles. Also in 1992, Apted had previously directed a documentary surrounding a Native American activist episode involving the murder of FBI agents titled Incident at Oglala. The documentary depicts the indictment of activist Leonard Peltier during a 1975 shootout on the Pine Ridge Indian Reservation. The film was a co-production between the motion picture studios of TriStar Pictures, Tribeca Productions, and Waterhorse Productions. It was commercially distributed by TriStar Pictures theatrically, and by Columbia TriStar Home Video for home media. Thunderheart explores civil topics, such as discrimination, political activism and murder. Following its cinematic release, the film garnered several award nominations from the Political Film Society. On November 24, 1992, the Original Motion Picture Soundtrack was released by the Intrada Records label. The film score was composed by musician James Horner. Thunderheart premiered in theaters in-wide release in the United States on April 3, 1992 grossing $22,660,758 in domestic ticket sales. The film was considered a minor financial success after its theatrical run, and was met with generally positive critical reviews before its initial screening in cinemas. The widescreen DVD edition of the film featuring scene selections and the theatrical trailer, was released in the United States on September 29, 1998. FBI agent Ray Levoi is assigned to aid in the investigation of a political murder, that of tribal council member Leo Fast Elk (Allan R.J. Joseph), on a Native American reservation in South Dakota. Agent William Dawes, Ray's superior, has chosen him for the task due to his mixed Sioux heritage, which might assist in the inquiry as they interview local townspeople. Ray is partnered with agent Frank "Cooch" Coutelle, who has diligently worked on the probe looking to apprehend a prime suspect: Aboriginal Rights Movement radical Jimmy Looks Twice. While helping Cooch track down the suspect, Ray gradually becomes sensitized to Indian issues, partially from his attraction to Maggie Eagle Bear, a Native American political activist and schoolteacher. Mocked and ridiculed by the locals (being called a "Washington Redskin"), including tribal police officer Walter Crow Horse, Ray finds that he has an unaccountable standing with some of the tribal elders such as Grandpa Sam Reaches. The natives recognize Ray as "Thunderheart", a Native American hero slain at the Wounded Knee Massacre in the past, and now reincarnated to deliver them from their current troubles. Much to Cooch's anger, Ray comes to suspect there is a conspiracy and cover-up involving the small town. He and Crow Horse later discover that a local government-sponsored plan to strip mine uranium on the reservation is at the root of the killings. The mining is polluting the water supply and fueling a bloody conflict between the reservation's anti-government ruling council and the pro-government natives who, led by tribal council president Jack Milton, are not above using violence to further their aims. Milton does not own the land where the mining occurs, but gets kickbacks from the leases. Cooch is later revealed to be part of the scandal to silence the opposition and help broker the land deal. Soon after finding Maggie Eagle Bear and former convict Richard Yellow Hawk murdered, a showdown ensues between Cooch and pro-government collaborators against Ray, Crow Horse and the anti-government activists. Cooch becomes outnumbered by the armed resistance and is later investigated on charges of corruption. Actor Val Kilmer who portrayed FBI agent Ray Levoi. 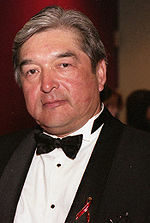 Graham Greene played the role of Indian officer Walter Crow Horse. The film was shot primarily on location in South Dakota. Specific sets included the Pine Ridge Reservation, which was dubbed the Bear Creek Reservation. Other filming locations used were in the Washington, D.C. area for the opening sequences. The film employed many Indian actors, some of whose screen roles mirror their real lives. The actor John Trudell, who played an Indian activist suspected of murder in the film inspired by the real-life events surrounding Leonard Peltier, is in fact an Indian activist, as well as a poet and singer. Chief Ted Thin Elk, who played an honored Lakota medicine man, is a Lakota elder himself. Badlands National Park and Wounded Knee in South Dakota were also used as backdrop locations for the real-life incidents which took place during the 1970s. Filming was done with the support of the Oglala Sioux people, who trusted Apted and Fusco to express their story. The original motion picture soundtrack for Thunderheart was released by the Intrada Records music label on November 24, 1992. The score for the film was orchestrated by James Horner, while original songs written by musical artists Bruce Springsteen, Ali Olmo, and Sonny Lemaire, among others, were used in-between dialogue shots throughout the film. Jim Henrikson edited the film's music. A paperback novel published by HarperCollins titled Thunderheart based on John Fusco's screenplay, was released on May 28, 1992. The book dramatizes the fictionalized events of the Wounded Knee Incident, as depicted in the film. It expands on the ideas of how an FBI agent's assignment to uncover the truth behind violence on an Indian reservation leads to a wide-range conspiracy. Rotten Tomatoes reported that 88% of 16 sampled critics gave the film a positive review, with an average score of 6.4 out of 10. Following its cinematic release in 1992, Thunderheart received two nominations from the Political Film Society Awards in the categories of Exposé and Human Rights. "A film this intent on authenticity might easily grow dull, but this one doesn't; Mr. Apted is a skillful storyteller. He gives 'Thunderheart' a brisk, fact-filled exposition and a dramatic structure that builds to a strong finale, one that effectively drives the film's message home." Chris Hicks, of the Deseret News, said screenwriter Fusco and director Apted created a "rich backdrop, with fascinating character development and a serious focus on the spirituality of Indian beliefs." He commented that "there's a lot more going on in Thunderheart that makes it well worth the trip—not the least of which is the performance of co-star Graham Greene, fresh from his Oscar-nominated Dances With Wolves triumph, wonderful as a wise-cracking American Indian cop." In a mixed review, Variety believed the film found "a lively platform for its essential view that the old ways were far wiser and better." However, they noted that actor Kilmer "holds the screen strongly in an intense young Turk role, but when script calls for him to transform into a mythical Indian savior, he doesn't quite fill the moccasins." Roger Ebert in the Chicago Sun-Times offered a positive review recalling how he thought "what's most absorbing about Thunderheart is its sense of place and time. Apted makes documentaries as well as fiction films, and in such features as Coal Miner's Daughter and Gorillas in the Mist and such documentaries as 35 Up he pays great attention to the people themselves - not just what they do, and how that pushes things along." Janet Maslin of The New York Times said the film had "the shape of a thriller" and a "documentary's attentiveness to detail". She also said that the "film's outstanding performance comes from Graham Greene, an Oscar nominee for Dances with Wolves, a film that looks like an utter confection beside this plainer, harder-hitting drama.... Mr. Greene proves himself a naturally magnetic actor who deserves to be seen in other, more varied roles." Critic Kathleen Maher for The Austin Chronicle viewed Thunderheart as an "element of misty romanticism about Native Americans that Apted just doesn't manage to pull off. His yarn, however, is a good one even if it could be told a little better." However, she added that "Apted manages to say a lot by cutting between the squalor of life on the reservation to the magnificence of the land around it. Unfortunately, when the characters speak for themselves, they are often forced to deliver lines that are unspeakable." Owen Gleiberman of Entertainment Weekly gave the film a C rating calling it "hokey" and "laborious". He viewed the film as a "leftover 1970s conspiracy thriller were it not for the novelty of its setting: a modern Indian reservation—which, as the movie reveals, is by now a fancy word for slum." He did however compliment actor Greene, calling his performance—the film's "one redeeming feature". Author C.M. of Time Out said that "Apted and cinematographer Roger Deakins focus unblinkingly on the poverty endemic to the reservation. This directness, however, contrasts with an over-complicated script by John Fusco." But he acknowledged that "the story boasts integrity and serves as a forceful indictment of on-going injustice." "In Thunderheart we get a real visual sense of the reservation, of the beauty of the rolling prairie and the way it is interrupted by deep gorges, but also of the omnipresent rusting automobiles and the subsistence level of some of the housing." Sean Axmaker of Turner Classic Movies boasted on the film's merits by declaring, "Thunderheart dispenses with clichés of Indian culture while respectfully showing the traditions kept alive on the reservation and exposing conditions on the reservation, all within the conventions of an entertaining and involving Hollywood murder mystery with a message." Rating 3 Stars, Leonard Maltin wrote that the film was an "engrossing thriller" that is "notable for its keen attention to detail regarding Sioux customs and spirituality, and its enlightened point of view." The film premiered in cinemas on April 3, 1992 in wide release throughout the U.S.. During its opening weekend, the film opened in 5th place grossing $4,507,425 in business showing at 1,035 locations. The film, White Men Can't Jump came in first place during that weekend grossing $10,188,583. The film's revenue dropped by 26% in its second week of release, earning $3,324,500. For that particular weekend, the film fell to 8th place screening in 1,090 theaters. The film Sleepwalkers, unseated White Men Can't Jump to open in first place grossing $10,017,354 in box office revenue. During its final weekend in release, Thunderheart opened in a distant 14th place with $1,111,110 in revenue. The film went on to top out domestically at $22,660,758 in total ticket sales through a six-week theatrical run. For 1992 as a whole, the film would cumulatively rank at a box office performance position of 55. Following its theatrical release, the film was released on VHS video format on July 8, 1994. The Region 1 Code widescreen edition of the film was released on DVD in the United States on September 29, 1998. Special features for the DVD include; scene selections and the theatrical trailer. Currently, there is no scheduled release date set for a future Blu-ray Disc version of the film, although it is available in other media formats such as video on demand. ^ a b c "Thunderheart". Box Office Mojo. Retrieved 2011-03-06. ^ a b c d e f Maslin, Janet (April 3, 1992). Thunderheart (1992). The New York Times. Retrieved 2011-03-06. ^ a b c d Michael Apted. (1992). Thunderheart [Motion picture]. United States: TriStar Pictures. ^ a b c "Thunderheart (1992)". Yahoo! Movies. Retrieved 2011-03-06. ^ a b c Axmaker, Sean (1992). Thunderheart. Turner Classic Movies. Retrieved 2011-03-06. ^ "Thunderheart Soundtrack". Amazon.com. Retrieved 2011-03-06. ^ Charters, Lowell (May 28, 1992). Thunderheart. HarperCollins. ISBN 978-0-380-76881-3. ^ "Thunderheart (2018)". Rotten Tomatoes. Fandango Media. Retrieved April 13, 2018. ^ Previous Political Film Society Award Winners. Political Film Society Awards. Retrieved 2011-03-06. ^ Hicks, Chris (April 8, 1992). Thunderheart. Deseret News. Retrieved 2011-03-06. ^ Variety, (December 31, 1991). Thunderheart. Variety. Retrieved 2011-03-06. ^ a b Ebert, Roger (April 3, 1992). Thunderheart. Chicago Sun-Times. Retrieved 2011-03-06. ^ Maher, Kathleen (April 10, 1992). Thunderheart. The Austin Chronicle. Retrieved 2011-03-06. ^ Gleiberman, Owen (April 17, 1992). Thunderheart. Entertainment Weekly. Retrieved 2011-03-06. ^ C.M. (1992). Thunderheart. Time Out. Retrieved 2011-03-06. ^ Maltin, Leonard (August 5, 2008). Leonard Maltin's 2009 Movie Guide. Signet. p. 1,414. ISBN 978-0-452-28978-9. ^ "April 3–5, 1992 Weekend". Box Office Mojo. Retrieved 2011-03-06. ^ "April 10–12, 1992 Weekend". Box Office Mojo. Retrieved 2011-03-06. ^ "May 8–10, 1992 Weekend". Box Office Mojo. Retrieved 2011-03-06. ^ "1992 Domestic Grosses". Box Office Mojo. Retrieved 2011-03-06. ^ Thunderheart VHS Format. Amazon.com. ISBN 0800115821. ^ "Thunderheart - DVD". SonyPictures.com. Archived from the original on 2011-06-29. Retrieved 2011-03-06. ^ "Thunderheart: VOD Format". Amazon.com. Retrieved 2011-03-06. Aleiss, Angela (2005). Making the White Man's Indian: Native Americans and Hollywood Movies. Praeger Publishers. ISBN 978-0-275-98396-3. Brown, Dee (1970). Bury My Heart at Wounded Knee. Holt, Rinehart & Winston. ASIN B000R9OFLO. Brown, H. (2007). Bury My Heart at Wounded Knee. Holt Paperbacks. ASIN B00434EYM4. Coleman, William (2001). Voices of Wounded Knee. Bison Books. ISBN 978-0-8032-6422-9. Flood, Renee (1998). Lost Bird Of Wounded Knee: Spirit Of The Lakota. De Capo Press. ISBN 978-0-306-80822-7. Gitlin, Martin (2010). The Wounded Knee Massacre. Greenwood. ISBN 978-1-59884-409-2. Gonzalez, Mario (1998). The Politics of Hallowed Ground: Wounded Knee and the Struggle for Indian Sovereignty. University of Illinois Press. ISBN 978-0-252-06669-6. King, Mike (2008). The American Cinema of Excess: Extremes of the National Mind on Film. McFarland. ISBN 0-7864-3988-2. Lyman, Stanley (1993). Wounded Knee 1973: A Personal Account. University of Nebraska Press. ISBN 978-0-8032-7933-9. Mann, Abby (1979). Massacre at Wounded Knee. Zebra Books. ASIN B00136MNIC. Marubbio, Elise (2006). Killing the Indian Maiden: Images of Native American Women in Film. The University Press of Kentucky. ISBN 978-0-8131-2414-8. Milligan, Edward (1973). Wounded Knee 1973 and the Fort Laramie Treaty of 1868. Edward A. Milligan. ASIN B0028ILJ0M. O'Neill, Laurie (1994). Wounded Knee: The Death of a Dream. Demco Media. ISBN 978-0-606-06894-9. Richardson, Heather (2010). Wounded Knee: Party Politics and the Road to an American Massacre. Basic Books. ASIN B004LQ0G6C. Seymour, Forrest (1981). Sitanka: The Full Story of Wounded Knee. Christopher Pub. House. ISBN 978-0-8158-0399-7. Silvestro, Roger (2005). In the Shadow of Wounded Knee: The Untold Final Chapter of the Indian Wars. Walker & Company. ISBN 978-0-8027-1461-9. Smith, Rex (1981). Moon of Popping Trees. Bison Books. ISBN 978-0-8032-9120-1. Utter, Jack (1991). Wounded Knee and the Ghost Dance Tragedy. National Woodlands Publishing Company. ISBN 978-0-9628075-1-0.